Paleo, gluten free, dairy free, and sugar-free recipes using real food, clean eating ingredients. Also find vegan, vegetarian, Whole30, AIP, and Candida-friendly recipes. These paleo pumpkin apple muffins are grain free and nut free. They're healthy enough to eat for breakfast and filling enough to make for a satisfying snack. We're in it now. Yes, we're in pumpkin season. Although I never know why pumpkin recipes need to be limited to just the fall. You can now buy pumpkin all year around. I never mess with breaking down a pumpkin myself to get the "meat." Why bother when you can buy them in a handy cardboard container? And yes, I prefer the box due to BPA issues with cans. So let's dig into these paleo pumpkin apple muffins. I've been feeling so much better since removing grains from my diet, including all gluten free grains and oats. So you'll see that these muffins are grain free. Unfortunately, most grain-free baking calls for almond flour, and I have an almond allergy. The nut flours definitely give a muffin a different consistency, but I was plenty happy with using just coconut flour here. 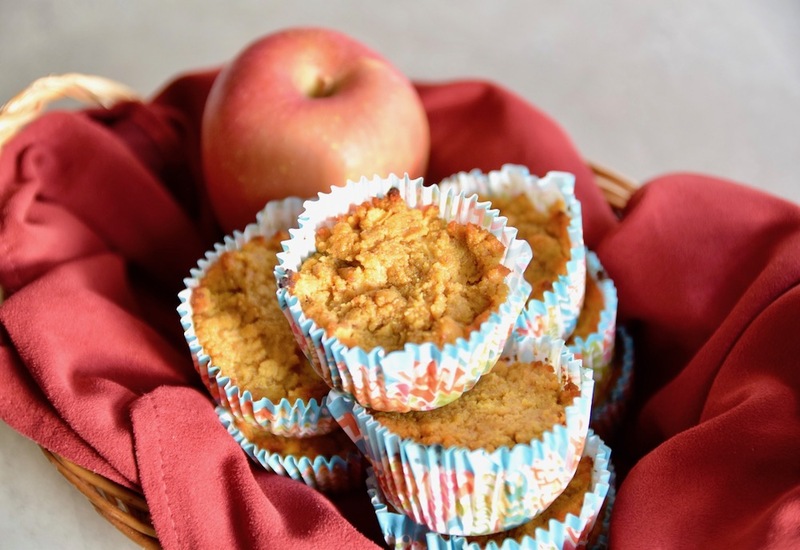 I love getting chunks of apple in bites of these muffins, but you can always use a food processor to break the apple down further. Lots of options for these healthy, clean eating, paleo pumpkin apple muffins that are grain free and nut free. And feel free to eat them anytime of year as well! Place the eggs, melted coconut oil, honey and vanilla in a large glass bowl and whisk until combined. Stir in the apple, pumpkin puree and applesauce. Add 1/2 cup of the coconut flour, cinnamon, ginger, cloves, nutmeg, baking powder and salt to the bowl and mix. Allow the batter to rest for 5 minutes. If it's still pretty loose, add more coconut flour. I added a total of 3/4 cup of coconut flour to mine but it will depend on your apples. Let stand again until the mixture is more firm. Place cupcake wrappers into muffin trays and fill 12 with the batter. Place in the oven. Bake about 30 minutes or until muffins are set and golden. Serve with butter, ghee, or honey. I'm a food fanatic who makes healthy whole food recipes, reviews the latest Los Angeles restaurants, appreciates fine wine and cocktails, and travels to experience different cultures and cuisines.